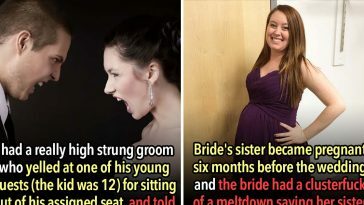 The only thing better than a fun, joyous, and all around feel-good wedding is one featuring a nightmare bridezilla fueled fully by narcissism and a bottomless craving for drama. 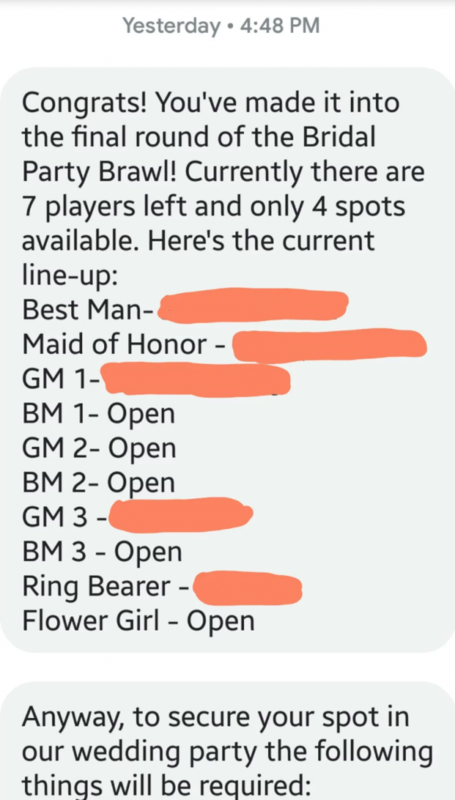 A bridezilla like the one in Redditor u/Suicides_and_sundaes‘s story, who instead of choosing her wedding party like the rest of humanity, opted to force seven humans into fighting for their positions like some demented wedding-themed episode of Survivor. 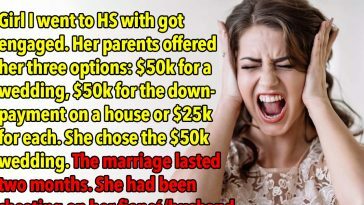 Except, on top of the whole “battle it out for the privilege of being in my toxic wedding party,” this particular deranged bridezilla wants her guests to PAY for it. Dearly. Wait it gets worse. 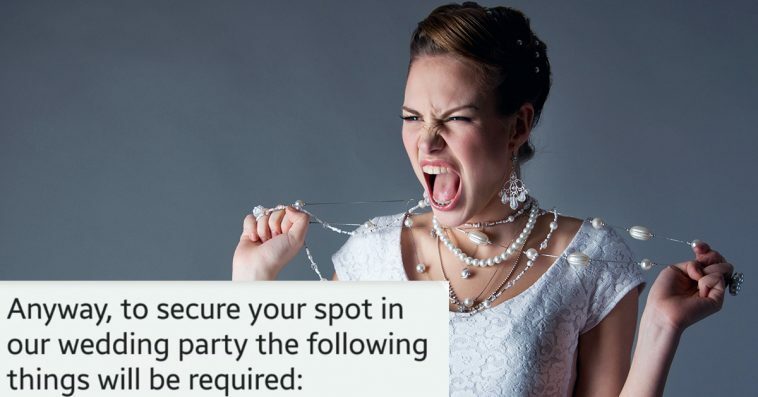 In order “to secure” their spots in the party, guests are required to fulfill an entire list of largely financially-driven tasks—and sign a contract holding themselves “legally responsible” in the event they fail to complete said tasks. 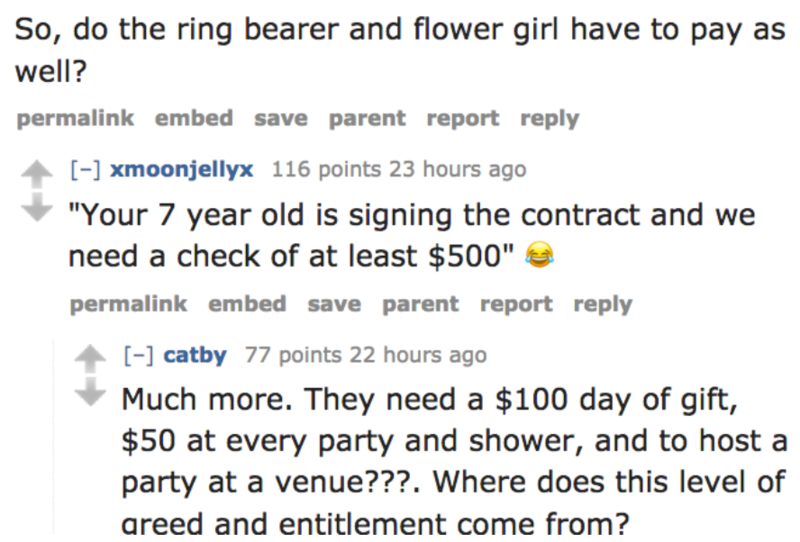 Tasks such as buying very specific gifts at very specific price points, hosting a party “at a venue other than someone’s house,” and attending every shower/party given. With a gift, naturally. 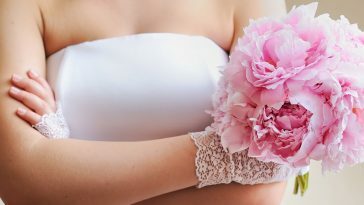 One person wondered whether the ring bearer and flower girl are to be included in the battle arena, and whether the children will be expected to adhere to the strict rules outlined by bridezilla’s contract. 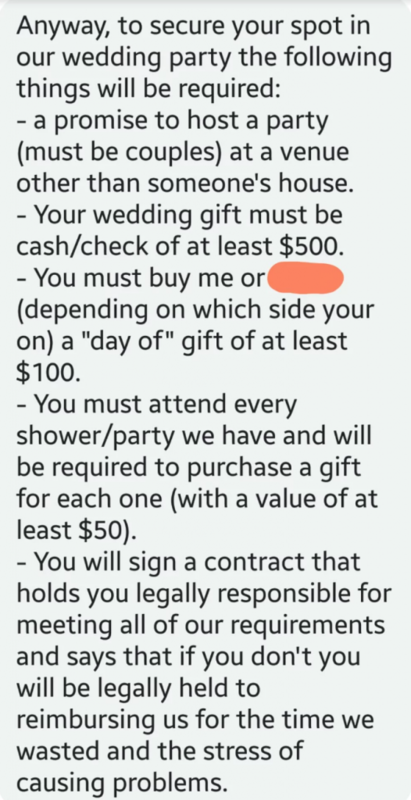 Someone also did the math on what it would cost to actually partake in the wedding as a member, finding it to be roughly $1150. 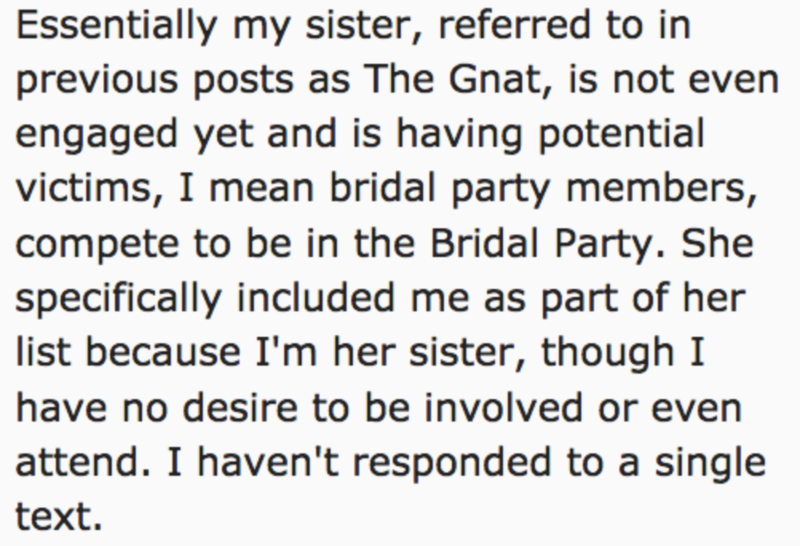 When asked what sort of self-hating person would be friends with somebody like this bridezilla, OP (who, as you may have already gathered, is her sister) replied that all of her friends are just as terrible as she is! Which, honestly, explains a lot. 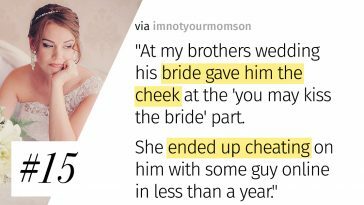 Bridezilla’s sister also informed commenters that all of the bridal party money gathered is set to go towards the happy (???) 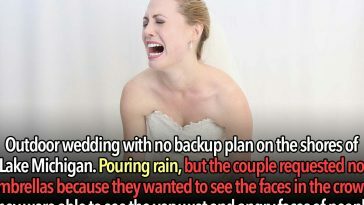 couple’s honeymoon in hell. 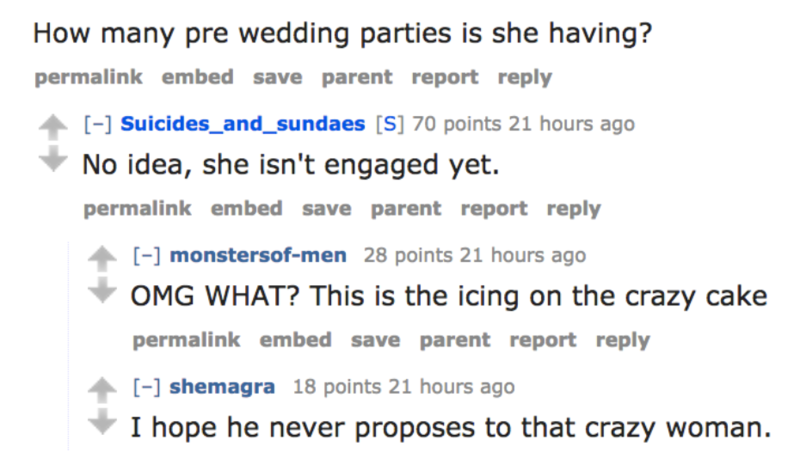 It’s true what they say: All’s fair in love and game-show-style-wedding-competitions!